Leave it lace. 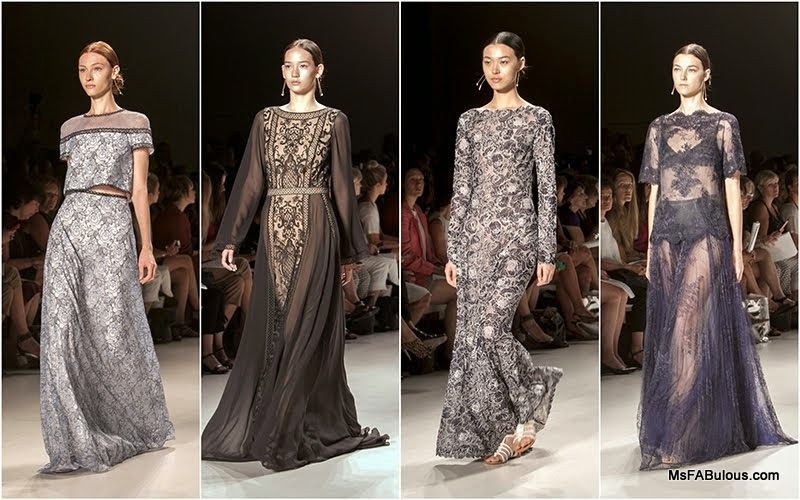 Tadashi Shoji’s fashion show at Mercedes-Benz Fashion Week demonstrated all of the beautiful things you could do with lace. There were two-toned black and white laces. There were engineered motifs. There were soft monochromatic laces in rich blue hues. There were daytime outfits that used lace as a trim or inserted panel. The overall effect was a beautiful, feminine collection that had a classic elegance. While many other designers are showing a lot of bare skin, Tadashi Shoji’s offered a variety of sleeve lengths and longer hemlines. This shows an awareness of his customer and more practical dressing. Contrary to what many of us like to see in magazines, there are a lot of people who actually like a bit more coverage in real life. There is also a large (wealthy) shopping contingent that also follows more modest dress rules (they call themselves “Mipsters”) in accordance with their religion. Not only that, when “spring” clothes hits the stores, it’s actually the beginning of February. Now, if you would like some skin showing, there were long gowns that showed the leg through very sheer lace. If you just want a peek of skin, there were styles that offered that in the form of a narrow transparent panel across the collarbone. Tadashi Shoji also offered forgiving silhouettes like relaxed shifts and capes. These styles looked no less tailored as they were beautifully finished with the most delicate of fabrics. It’s nice to know there is at least one high end designer who consciously designs for all body types and communities within his collection. This is a fact that women who don’t fit the traditional Hollywood body type have learned to embrace on the red carpet. Isn’t it comforting to know that whatever shape you get into, Tadashi Shoji has your back!